This isn’t about the grade “C”. It is about the benefit of writing a circle by starting with the letter “C”. I just taught a dad how to build his son’s handwriting skills without teaching him any letters or numbers. His son will be starting kindergarten in the fall, and although there were few worksheets in preschool, we all know he will get lots of worksheets in September. Many of those will ask him to circle the correct answer. If this child and his dad use my suggestion on practice sheets this summer, he will be improving his pencil control and start/sequence automaticity for handwriting. Without ever writing a word. All he needs to do is to circle the target on his worksheet by writing a letter “C” around it, then continuing the stroke from the bottom to the top to close the circle. Handwriting Without Tears talks about the “magic c”. It is pretty magical the way that children who begin letters this way develop faster formation recall and better speed/control for “O”, “G”, and “Q” in preschool, and “a”, “d”, “g”, “o”, and “q” in kindergarten. The initial formation of a “c” for these letters is exactly how HWT’s preschool book teaches drawing a circle. Making the leap from drawing circles to circling answers on classroom worksheets sometimes gets lost in translation. It shouldn’t. Combining motor skills with visual search/discrimination,literacy and math skills on a worksheet is where the rubber meets the road in kindergarten. You will start to see which kids are mastering writing and which are struggling with one or more components. Many of my kids will look pretty good with one-on-one instruction in letter formation, but then when perceptual skills, spelling and line placement are expected, they crumble. If their start/sequence and formation is rock-solid, it frees up attention for learning where and how to look, thinking about the correct answer, and marking it with a circle or writing a response. Children that start a circle on the bottom or the side of a target, or start at the top and turn to the right side (a backward “C”), will then have to think briefly every time they begin writing one of these curved letters. It isn’t automatic for them. Every type of manuscript writing will start these letters in the same manner, so if your school teaches D’Nealian or Zaner-Bloser, and not HWT, you are still following the correct formation. Don’t worry about letters and numbers that reverse this pattern, like “D’ and “3”. When you use the HTW chalkboards or Gray Block Paper, you avoid reversing these letters. The magic “c” letters appear more frequently as a group in early literacy (excepting “Q q”) so they are more essential for legibility at this early stage. All will be well. Preschool is the perfect time to introduce this idea of using a “C” to circle things, since most kids are excited but a bit nervous about making it in the big time. Teaching them that circling their answer this way is the more “grown-up” choice makes them feel confident and mature. You don’t have to mention the part about how much better it is for their writing. This entry was posted in handwriting, occupational therapy, parenting, preschoolers, Uncategorized and tagged baseline placement, D'Nealian, handwriting without tears, how to draw a circle, letter start and sequence, preschool worksheets, summer kindergarten preparation, Zane-Bloser on June 25, 2016 by Tranquil Babies. An exercise in frustration for your child! 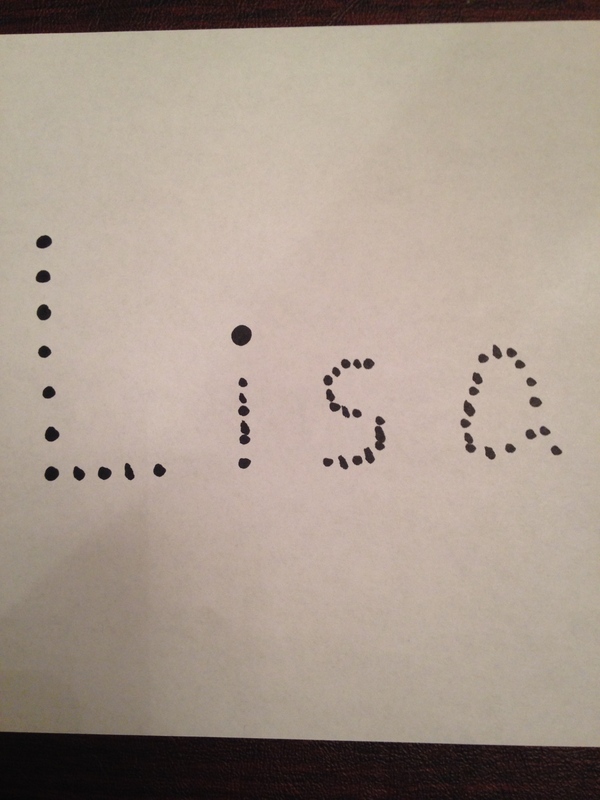 I recently saw a preschool homework sheet with dots forming the child’s first name. My initial thought was “Not again!”. And then I decided to be a bit more kind. Preschool teachers aren’t given any solid instruction in how to teach pre-writing. They are trying their best, and hoping that the workbooks they have in the classroom or the websites they visit will help them. Sadly, most aren’t up to the task. I have trained preschool teachers in workshops and they are usually eager to learn techniques that make handwriting lessons easy and successful. Most admit that they had little or no instruction in how to teach toddlers to write. If you are a parent of a preschooler or a teacher, and you want to support pre-writing with your child, here are some suggestions based on established neuropsychological research on fine motor and visual-perceptual development. Reading and writing are two different skills. Seems obvious, right? One is primarily language based, with auditory and visual-perceptual components. The other is related to hand strength and coordination, motor planning, sensory processing and visual-perceptual skills. You can teach them together, but I think teaching them apart makes more sense and is less stressful for children. Most children have the ability to recognize letters before they can write them. Tracing a letter that you don’t recognize seems like a waste of time at best. Uppercase letters are easier to recognize and easier to write. They are all the same size, writing begins in the same location for each letter (at the top, not necessarily at the top left), and the easier muscle movements do not require tracing back. Tracing back on a line is much harder for little hands. Use letters that are easier to identify and copy from a visual-perceptual and visual-motor perspective, not the hanging alphabet strips. Start teaching uppercase letters first, and begin with the letters composed of vertical and horizontal lines. Demonstrate the sequence of movements to write a letter clearly, which means writing upside down if the child is sitting across the table from you. Use simple descriptions of those movements. Handwriting Without Tears excels in this approach. Imagine learning to dance with either simple directions or with complicated French terminology. And then imagine copying dance moves directly or trying to reverse them as you dance in front of the instructor. Use writing tools sized to fit small hands and developing coordination. Crayons have some “grip” on the paper and give more pressure and touch feedback than thin pencils or smooth markers. Again, Handwriting Without Tears does a great job with tiny little flip crayons and short pencils that both support good grasp but also promote the use of mature grasp. Triangular crayons and the app crayon stylus have appeared on this blog in the past because they also support the development of a controlled pencil grasp. This entry was posted in handwriting, occupational therapy, parenting, toddlers and tagged app crayon, handwriting without tears, preschool handwriting, triangular crayons on February 14, 2015 by Tranquil Babies.